The Rosenberg trial was the most famous trial of the 1950s. Julius and Ethel Rosenberg were arrested in July 1950 and put on trial for conspiring to steal American secrets about the manufacture of the atomic bomb and for selling them to the U.S.S.R. (Russia). Many people felt that there was not enough evidence to convict them. Atomic scientists who testified at the trial felt that the information the Rosenbergs allegedly gave to Russia was too incomplete to help the Russians. To this day, there is still disagreement about whether the Rosenbergs were guilty, especially Ethel. The Rosenberg's attorney fought for two years to save their lives. But Julius and Ethel were executed at 8:00 p.m. on June 19, 1953, at Sing Sing Prison in Ossining, N.Y. They left behind two young sons. How do global conflicts impact a society? Summarize the main idea of this document and explain its connection to the Cold War. 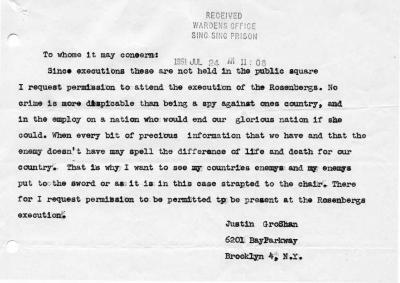 Request to witness the execution of Julius and Ethel Rosenberg for treason, July 24, 1951. After viewing the picture of the electric chair, what are your thoughts about it? Research the Rosenberg Trial. Decide whether you think the Rosenbergs were guilty of espionage (spying). Give reasons to support your answer. Math: How many years passed between the Rosenberg’s arrest and their execution? Science: Why does electricity passing through the body cause death? English Language Arts: Do you think that there should be a death penalty? Give reasons to support your answer.